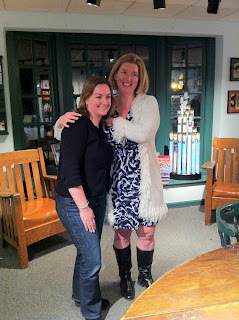 My family and I drove almost two hours to the famous indie bookstore R.J. Julia in Madison, CT last night to connect with the bookstore folks and fellow book lovers. And it was wonderful. We had rescheduled my "appearance" from early January to the present because of a snowstorm, and I am so glad that it worked out that way. 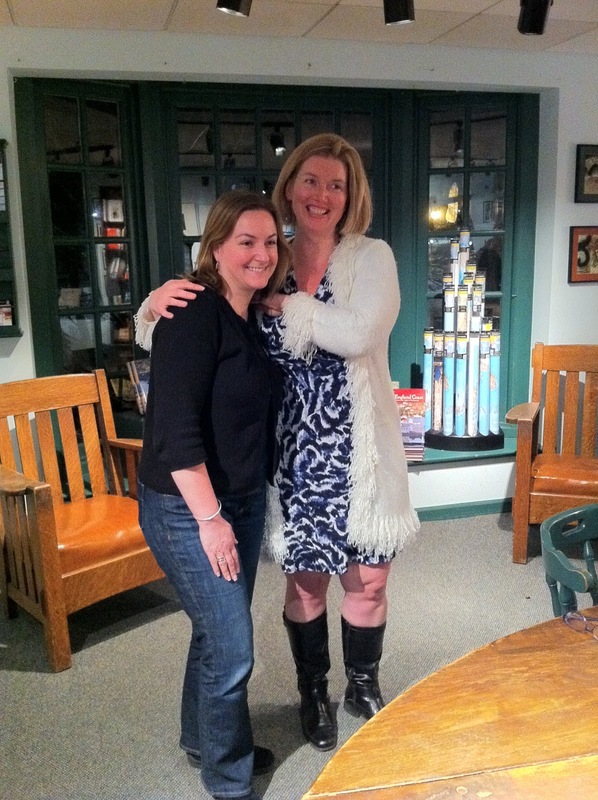 It gave the lovely Kaley S. DeGoursey, (kid and teen lit buyer and coordinator - pictured with me here!) a chance to listen to the audio of Edges and connect with me as a friend, even though we hadn't met face to face. She has become a huge champion for Edges, and a fierce Lexulous competitor - keeping me on my toes! The space is one of the most beautiful I've ever been in, with nooks, crannies, and discreet areas for reading. I felt so calm and centered just walking in! Living life creatively means building community and connecting with others. We write for ourselves, yes, but we also write with a desire to share ourselves with others. I write/blog not only to share my thoughts, but to build a community of other writers and readers. Of course I want my book(s) to sell, sell, sell, but for right now, I need to focus on one reader at a time. Being a writer is really three jobs in one. There is the writing of course. But then there is the social networking which is constant, and the traveling to connect face to face with readers - and it's not always a crowd. We came extra early to the bookstore so that I could have some 1:1 face time with Kaley at the café, (while my family gorged themselves on books) an internet friendship solidified by being able to look each other in the eyes. Then we had a lovely, intimate reading and discussion of Edges and the writing process in a beautiful room where we were all able to sit around a large oval table. Two friends who I hadn't seen in five years came! And a woman came from afar having stumbled on this blog just the other week! Plus a few more . . .
And there were cupcakes! Kelly, another one of R.J. Julia's fabulous booksellers moderated the event, providing said cupcakes and books for me to sign. They even offer visiting authors a book of their choice! I'm like a kid in a candy store when it comes to that - so overwhelmed by choices - and the husband had already bought books for the kids to keep them entertained, so the new memoir by Andre Dubus 3 found it's way into my hands. I'm connecting one reader at a time. It's real, and that's the way I like it! Thanks guys - so wonderful to connect with you both and so honored we are in community together! How did you know I had cupcakes for breakfast? *smiles sheepishly* You see how we think alike? The cappuccino cupcake was amazing with my coffee! And Alison - bring on the morrow! Woot! A woman from afar. . . makes me sound so mysterious. Ha! It was a pleasure meeting you and listening to you read from your wonderful book. That’s really a good idea and you had a very good time, I often visit the place to read a book. I always read your books and purchase them from https://www.essayuniverse.net/essayontime-review/ writing companies. I always admire your writings and wish you write more books to entertain your readers. I wish to meet you soon and a fan it is my dream.